A driver headed the wrong way who was killed after slamming into a truck on the Turnpike in Broward County early Monday morning may have crashed on purpose, authorities said. The crash happened just before 12:30 a.m. at Griffin Road. According to Florida Highway Patrol, the 26-year-old male driver was headed the wrong way on the southbound Turnpike in a Hyundai when he slammed into an 18-wheeler and flipped upside down. The wrong-way driver, later identified as Tzvi Ference, was killed, while two passengers inside the 18-wheeler were not injured. Ference had recently posted on Facebook about battling depression and had even posted about the exact scenario in which he died. 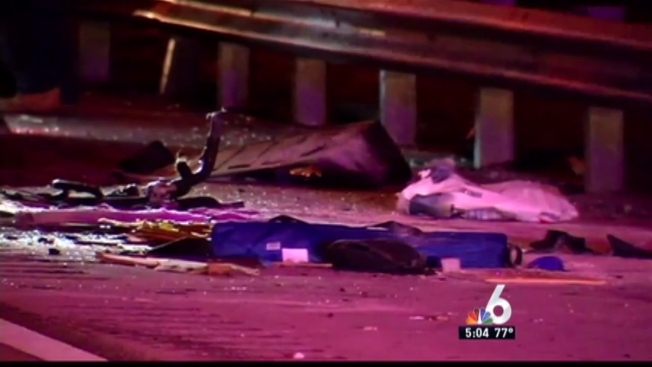 The Florida Highway Patrol says a man killed in a wrong-way crash on the Florida Turnpike may have crashed on purpose. Tzvi Ference had recently posted on Facebook about depression and about crashing his car while driving the wrong way on a highway. 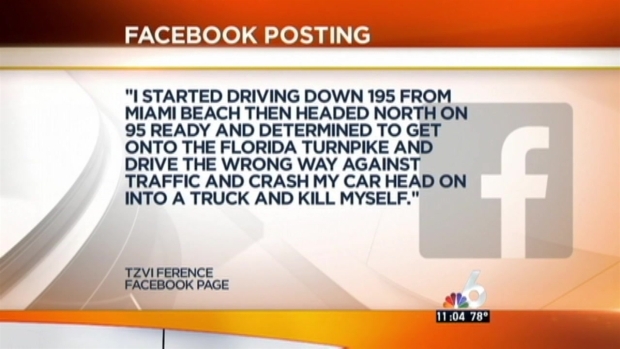 "I started driving down 195 from Miami Beach then headed north on 95 ready and determined to get onto the Florida Turnpike and drive the wrong way against traffic and crash my car head on into a truck and kill myself," he posted Friday. Ference's family declined to speak about his death Monday. Miami Beach Police released a report from Saturday where Ference was accused of harassing people at Temple Emanu-El on Washington Avenue, where he was a member for a year. InvestigativeHow Can We Help Prevent Wrong-Way Wrecks? Police said he was given a trespass warning. A rabbi at the temple said Ference was allowed to stay at the temple and added that family and friends had tried to help him with his mental illness for years. No one else was injured in the crash. A driver told NBC 6 that they swerved to avoid the crash and hit the rear of another vehicle. That driver was not injured. The Turnpike was shut down at Exit 53/Griffin Road with all lanes completely blocked. Those lanes have since been reopened. A wrong-way driver was killed after slamming into an 18-wheeler on the Turnpike southbound in Davie. NBC 6's Julia Bagg and Kelly Blanco report. Follow NBC 6 traffic reporter Kelly Blanco on Twitter for the latest traffic information and updates.